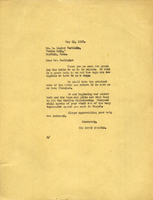 A letter of thanks to Mrs. Harrison for all of her involvement with Berry Schools and her faithful donations to help the poor children. 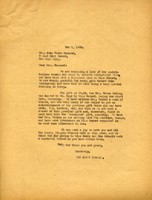 Martha Berry informs Mrs. Harrison that a copy of the book "Martha Berry" was mailed to her. 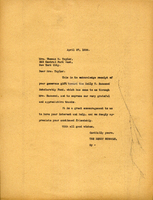 Miss Martha Berry is thanking Miss Murray for the gift send through Mrs. Hammond. She goes on to describe the hardwork done without complaint in the heat of summer, without complaint. 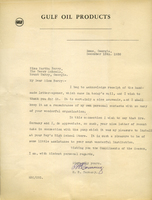 A letter enclosing the list of the contributions toward the Emily V. Hammond Scholarship fund. 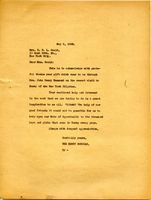 The letter goes on to include specific recent donations as well. 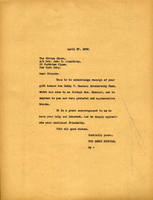 The letter closes with their joy in having her the and the pilgrims come and stay with them earlier that year, and their thankfulness for her friendship. Mrs. John C. Aisenbrey's Civics Class donated money to the Emily V. Hammond Scholarship Fund. The Berry Schools sends their thanks. 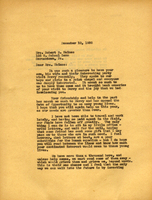 The Berry Schools write to Mrs. Thomas M. Taylor thanking her for her donation towards the Emily V. Hammond Scholarship Fund. 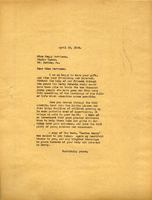 She thanks Mrs. Robert B. Haines and her husband for their recent visit to Berry and the address they gave the students that was very interesting. She writes of her hopes of their continued financial help because of their recent financial hardships that is making her fear having to send some away because of the lack of funds to support all the students. Thanks for Mr. Carlisle sending them a table to be copied, and the promise of its good care until its return. Also their enjoyment of Mr. Carlisle's speech in the chapel on his visit. 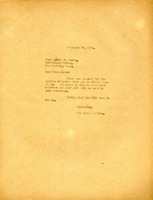 A letter of thanks to Miss Martha Berry for the letter opener he received from her in the mail. He goes on to mention her letter of thanks for his work in installing a pump at the Boy's High School Store and how he was happy to be of assistance to her institution. Martha Berry thanks Martha Graham for her messages and says she thinks of her often. 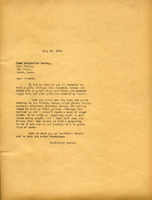 She expresses hope that the reunion will go well, and then tells Martha Graham that she will be satisfied with wherever Martha Graham can find work. 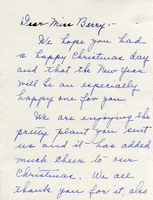 A letter of thanks from Mrs. Green to Martha Berry for the Christmas present of a pretty plant. She goes on to describe how happy her and her family are there at Berry during the Christmas season. She writes of the great Christmas spirit and joy that Berry brings to the holidays, and their great happiness in being apart of it. She mentions losing her mother earlier that year, and also describes her mother's great love and dedication to the school as well. Martha Berry expresses her thanks for Mrs. Gould's gift and her support of the Berry Schools. Thank you letter for a donation of cards to the The Berry Schools. Harvey is returning the original sketch of a doily that they sent him and thanking them. 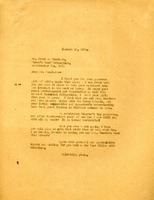 This is a letter from Martha Berry to the Chambers family. She expresses her deep gratitude for their contribution of $2500 and explains how much their continued help means to her.